POOL AND HOT TUB: Hours OF USE: DAWN to DUSK. The pool and hot tub are to be used entirely at the own risk of the Unit occupants and their registered guests. Pool and hot tub use is restricted to registered occupants and approved registered guests only. Children must be supervised by an adult at all times while in the pool/hot tub area. NO DIVING, BEACH OR SAND TOYS IN THE POOL. NO THROWING OF BALLS, TOYS or RUNNING shall be permitted in the POOL/HOT TUB AREA. NO GLASS SHALL BE PERMITTED IN POOL/HOT TUB AREA. Pool / Hot tub is located off property. Welcome to La Estrella Casita EAST and La Perlita WEST! These gorgeous freshly remodeled beach casitas are the perfect getaway for you and your closest friends and family! Included with your stay: Complimentary Bicycles, Beach chairs, Beach-Towels, Free-rides around Siesta and a 7-day week office for your convenience and guest needs.The décor is beautifully done and so reminiscent of the seashore and beach [found only in the Point of Rocks area]. It’s clearly luxurious here. Enjoy a stunning interior finish, as the owner spared absolutely no expense in remodeling and furnishing the home! Everything is brand new and boasts only the best quality. As you might expect La Estrella and La Perlita Casitas are truly a decorator’s dream offering a bright and sunny disposition enhanced with coastal decor and white trim. Sleeping accommodations for 6 are provided with both bedrooms featuring king or Queen size beds (sleeps 2 in each room) and a plush comfy queen size sofa sleeper in the living room (sleeps 2). There are two bathrooms that are spotless, featuring all new cabinets, fixtures, toilets, and tub and shower combinations. Brand new soft plush couches, beautiful new décor and flat panel, wall-mounted TV’s abound everywhere [all bedrooms and living areas] make visiting La Estrella Casita such a joy for your family and friends. Fine linens, towels and everything else are truly “first class” here. Everything you need for a wonderful experience is here. Outside you’ll find bicycles and beach equipment and private parking for up to two vehicles. Outside seating is available for those quiet moments you sometimes need or reading if you can find the time. 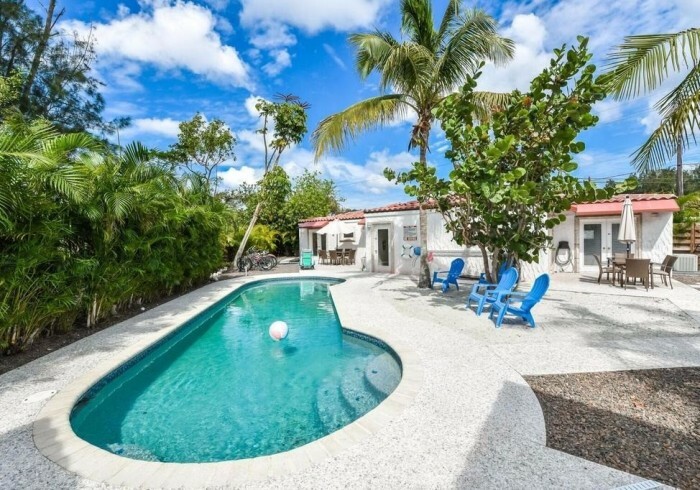 Enjoy immediate access to the pool area from this casita only! As you sit by the pool in the warm sun relaxing, you’ll struggle with the decision to go down to the Nation’s number 1 beach or perhaps to the south village area, all within easy walking or biking distance of La Estrella Casita. The lush, tropical landscaping up-lighted for special effects at night immediately reminds you of your attraction to Siesta Key Beach, our tropical paradise. La Estrella Casita and La Perlita are truly unique and new vacation home that you, your family and friends will truly enjoy, and sure to be your choice returning year after year. Contact Name : Crescent Street .